An inspired choice of gaming laptop? Try looking for Dell’s Inspiron 15 7000 Gaming laptop series these days and you’ll likely find they’ve been scrubbed from the internet. That’s because they’ve now been replaced by Dell’s new (and infinitely easier to parse) Inspiron G series, one of which I’ve got on test here today – the Inspiron G5 15. Now packing proper Intel 8th Gen Coffee Lake CPUs, Dell’s new Inspiron G series comes in two flavours: the entry-level G3, which largely comes with Nvidia GeForce GTX 1050 and 1050Ti graphics options in both 15.6in and 17.3in screen sizes, and the mid-range G5, which pushes things into Nvidia GeForce GTX 1060 territory but only in 15.6in configurations. Has Dell learned their lesson from their Inspiron 15 7000 days? Let’s find out. The short answer to that question is, sadly, a resounding ‘No’. 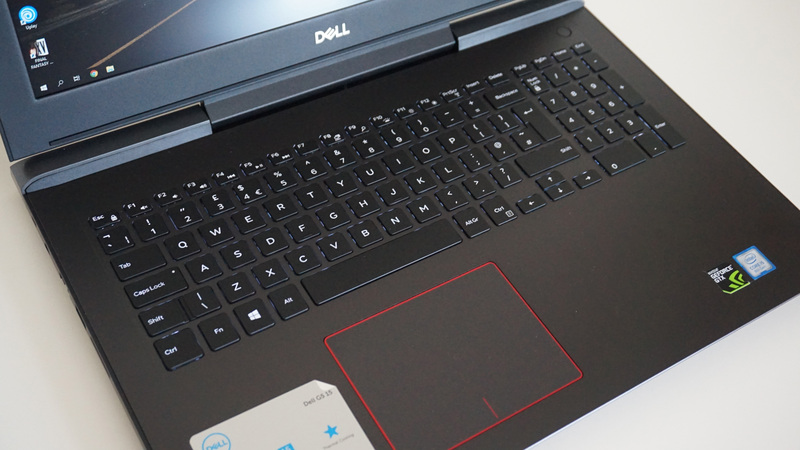 As you may recall from my Inspiron 15 7000 review, the main flaw with Dell’s previous generation of everyday gaming laptops was that atrocious display. I had hoped things might be different with the G5 15 this time round, and when I first got it out of the box, I crossed every finger and toe that my calibrator would bring me a good result. After all, it doesn’t actually look that terrible in the flesh. Colours are perhaps a little muted, with reds in particular looking a bit pale and sickly, but on the whole, it’s surprisingly decent-looking. Not bad enough that I immediately wanted to shut the lid and never look at it again, and certainly good enough to play games on without feeling like you’re looking through a very literal pair of rose-tinted glasses. Alas, my X-Rite i1 DisplayPro returned an even worse colour gamut coverage score than the Inspiron 15 7000, showing it was only able to display a paltry 51.3% of the standard sRGB colour gamut. That’s pretty awful for an IPS panel, and even worse when you’re stumping up close to a grand for it. Sadly, every G5 15 spec comes with the same 15.6in 1920×1080 IPS anti-glare display, so it’s not like you can escape it by opting for a more expensive model, either. I was also a bit disappointed with its contrast ratio of just 884:1 as well, as I’d normally expect something a little closer to 1000:1. The rest of my measurements weren’t too bad in the grand scheme of things, with brightness hitting a very reasonable maximum of around 250cd/m2 (which is just about enough for working in bright sunshine), and black levels reaching a decent 0.28cd/m2 (the closer to 0.00cd/m2, the better). Nevertheless, it’s still a bit of a bummer to see such a poor screen on a laptop of this calibre – especially when all of Dell’s Alienware 13 laptops, which start at £1099 / $1399, now come with that lovely OLED display I liked so much earlier in the year. Admittedly, the Alienware 13 laptops are both smaller than the G5 15 and still touting Intel’s 7th Gen Kaby Lake processors rather than the newer Coffee Lake chips. In many ways, though, I’d rather compromise on processing power for a better, higher resolution display. The main benefit of sticking with the G5 15, however, is that you can still get all the power of Nvidia’s GTX 1060 graphics (albeit in its laptop-friendly and energy efficient Max-Q form) without breaking the £1000 barrier in the UK (and only just go over it in the US). With the Alienware 13, on the other hand, you’re looking at spending £1600 / $1600 for the same graphics option. The model I’ve got here, for instance, is the highest-specced quad-core 2.3GHz Core i5-8300H model, which comes with a 6GB GTX 1060 Max-Q chip, 8GB of RAM, and a 128GB SSD and 1TB HDD combo. This currently costs £999 in the UK, and $1099 in the US, making it significantly cheaper than their Alienware counterpart. Indeed, the GTX 1060-equipped G5 15 handled almost every game in my testing suite without breaking a sweat in most cases (okay, so there was a lot of fan wheezing involved, but when is there not? ), hitting close to 60fps at maximum settings without any significant compromises. Doom and Wolfenstein II: The New Colossus actually went even urther than 60fps on their respective Ultra and Mein Leben settings, the former hitting between 90-110fps depending on how many demon skulls you were bashing in at any one time, while the latter settled around 70-80fps. Of course, you won’t get the benefit of these higher speeds unless you hook the G5 15 up to a high refresh rate external display, as the screen on the G5 15 caps out at the usual 60Hz. Still, a little bit of extra headroom is always handy if you’ve got the kit to make the most of it. Likewise, Agent 47 glided through the crowds at Hitman‘s Paris fashion show at a silky smooth average of 56fps on Ultra, while Middle-earth: Shadow of War whizzed through its internal benchmark at a highly respectable 52fps average on the same graphics setting. You can squeeze a couple of extra frames out of the latter by dropping down to Very High, helping you get the game’s orc-slashing action closer to that 60fps sweetspot, but I’ll eat Gollum’s rag cloth if I can actually tell the difference without the aid of a frame rate counter. I was also impressed by how well the G5 15 handled the notoriously demanding Assassin’s Creed Origins as well. While Ultra was a little bit beyond its reach, Very High produced a stable average of 55fps when I fired up the game’s internal benchmark, which is one of the best scores I’ve seen from a gaming laptop outside the ludicrously expensive HP Omen X 17 and the MSI GT75VR Titan Pro, both of which had a Nvidia GeForce GTX 1080 under their hoods. Naturally, there will still be a few games that require the odd bit of tweaking. Rise of the Tomb Raider‘s tough 4x SSAA, for instance, saw the frame rate plummet to an overall average of 35fps on Very High when I ran its built-in benchmark, with frame rates plummeting as low as 15-17fps across all three tests. Stick that anti-aliasing down to the infinitely more manageable FXAA setting, however, and Lara’s globe-trotting adventures will zipline back up to well over 60fps, all without ever dropping the overall graphics quality. Total War: Warhammer II also proved to be a bit of a challenge for the G5 15, with Ultra once again proving to be a step too far in our quest for 60fps perfection. This resulted in some rather choppy battle sequences around the mid-30s when I ran through the game’s benchmark scenarios, but stick it on High and those bloodthirsty Lizardman brawls will be back up around the 57fps mark. I also found I had to settle for High on The Witcher III, even though Ultra produced a perfectly decent average of around 45fps. Here, the camera felt too sluggish and choppy for comfortable play. On High, however, Geralt’s movements immediately became that much smoother, allowing me to spin the camera without feeling like I was on one of the game’s rickety row boats. The G5 15’s power button also doubles up as a fingerprint reader. Final Fantasy XV, meanwhile, ended up being the trickiest to tame. While its vanilla Highest graphics setting (that is, without all of Nvidia’s extra effects turned on) produced an eminently playable 50fps average, those hoping to oogle over Noctis’ HairWorks and Lucis’ TurfEffect-enabled grass will probably have to settle for High or Average. You’ll probably just be able to scrape somewhere around the 45-50fps mark with HairWorks, TurfEffects and ShadowLibs enabled on High, but switch on VXAO and the frame rate will tumble all the way down to 35-40fps. That’s not the end of the world, of course, and still better than what you’ll get on consoles, but those after that coveted 60fps will probably have to compromise on graphical fidelity if souped up lighting effects happen to be your particular elixir. Still, if I was looking for a Full HD portable gaming machine that could play most of the big PC games from the last couple of years at max settings, the G5 15’s GTX 1060 models make a very compelling argument. You’d be hard-pushed to get a desktop that could do all this at a similar price, and it’s not something you’d be too embarrassed to get out in public either. 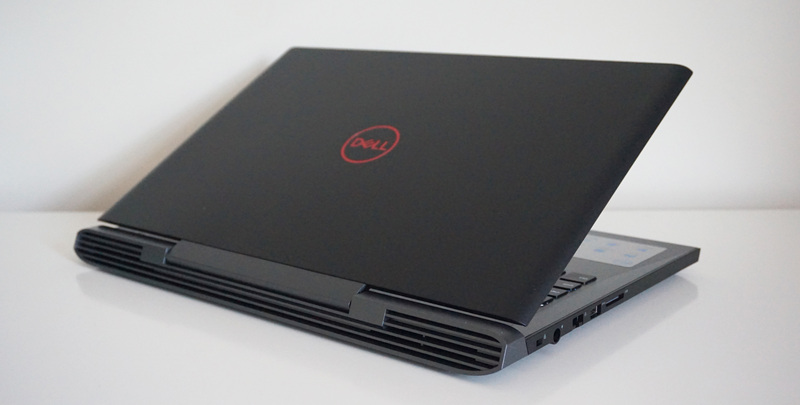 Its 25mm thick dark grey plastic chassis isn’t the most attractive thing in the world, but apart from its red Dell logo on the back and subtle red trim round the large, spacious touch pad inside, this is about as non-gamery as gaming laptops get. The G5 15’s quad-core 2.3GHz Core i5-8300H processor isn’t half bad either. While the notion of settling for a Core i5 laptop may send some people running, this particular CPU is more than up to the task of handling games (the benchmark results above are testament enough to that) and everyday tasks alike. In Geekbench 4, for instance, it offered near-comparable performance to last year’s gaming laptop processor of choice, the Core i7-7700HQ, scoring 3284 in the single core test and 9450 in the multicore test. The back-lit keyboard is pretty all right, too. The keys don’t make too much of a racket when typing, and there’s enough travel and tactile feedback to know when you’ve pressed them correctly. They’ll never replace the speed and feel of a proper mechanical keyboard, of course, but I certainly had no problems getting all my movements to register in Doom when wheeling from side to side dodging incoming demon fire. The large spacious wrist rest doesn’t dig into your arms, either – which is always a plus in my books – and the all-in-one touch pad is nice and clicky across its entire surface. Certainly a step up from other laptop touchpads I’ve used in the past. The G5 15 also comes with a generous selection of ports, including three USB 3.1 Gen1 ports (one of which also supports Power Share for charging your phone and powering other devices), one Thunderbolt 3 Type-C port, a full-sized HDMI 2.0 output, SD card reader, Gigabit Ethernet and a combined headphone and microphone jack. If only that screen was better. Then the Inspiron G5 15 would be a really compelling gaming package for the money. As I mentioned before, I don’t think the display is quite as terrible in the flesh as my measurement figures might imply, but man does it put a bit of a downer on things. In its defence, I’ve yet to see any gaming laptop with a decent screen in this kind of price bracket (*cough*Acer Nitro 5*cough*), so maybe it’s just something we’ve got bite the bullet on in order to get this type of power without rinsing our entire life savings on it. Don’t get me wrong – I wish laptop makers would do better in this department and give us gaming screens that rivalled the colour accurate displays found in their fancy, ultraportable lines, but unless you’re willing to stump up the cash for something like the Alienware 13’s OLED display, it just doesn’t look like something that will change any time soon. 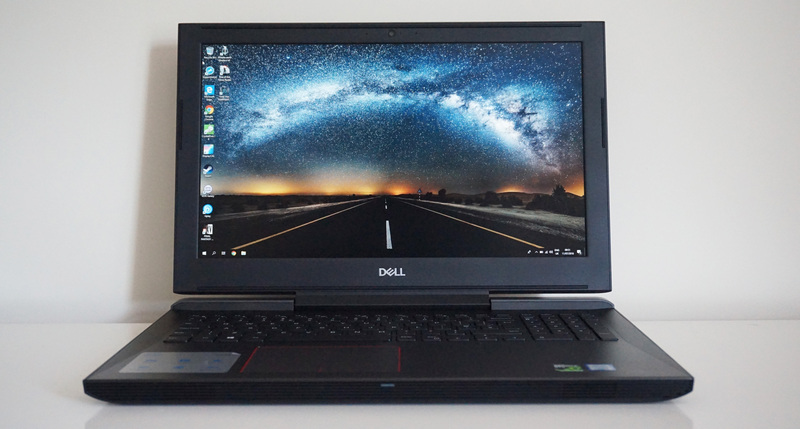 With that rather large caveat in mind, the Dell Inspiron G5 15 is a decent gaming laptop if you’re willing to put up with its mediocre display – and is probably a pretty great deal if you can get the Core i7 model of this laptop (also with GTX 1060 graphics) for the same price as this one (£999, down from its usual price of £1299) next Tuesday on July 17 as part of Dell’s Black Friday in July deals. For those after true portable gaming perfection, however, you should probably save another couple of hundred pounds / dollars and get something like the Alienware 13 or the Asus ROG GL702ZC instead. Tagged with Dell, feature, Hardware, laptop, laptops.